Radisson SAS Plaza Hotel is the tallest skyscraper in Norway and the tallest hotel in Scandianvia. The 1 class hotel building was built in 1991 and has a height on 117m. The tower is situated in Downtown Oslo, next to Posthuset. These two create a small Oslo skyline. Posthuset is the second tallest high-rise building in Norway counting 111m. The tower was first built in the 70 counting 84m, and was famous for its ugly look. In 2001-2003 they reconstructed the tower, and is far nicer today. Posthuset creates the main Oslo skyline at downtown. Main entrance, a great design in my opinion. I like them. I like reflective glass buildings though. I especially like the Radisson and the Rica Sellet. Too bad these aren't available in Sim City. The Rica Seilet is an amazing structure! It looks so perfect...I can't believe there was so much opposition to its construction! Yes, Rice Seilet looks as Burj Al Arab in Dubai. In fact, the architect was in Dubai just before he got the idea of this building. There is a lot of opposition agains high-rise buildings in Norway. Nowday not one single one gets approved. We have just a few which the city council actually approves, and if they do that the project meet a lot of opposition. Right now we don't have one high-rise buildings which is under construction. But in Stavanger we have a 4 high-rise project which was approved and will start construction next year. But this project did not cause much of opposition at all. But in Oslo we have a large project in downtown which will create a skyline next to Radisson SAS and Posthuset. 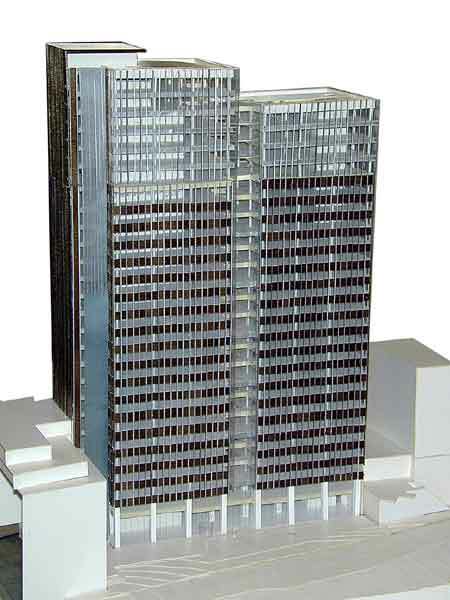 It has been approved and content buildings up to 20 floors. Its a lot of opposition agains that project.